This is a really elegant silver plated tray by the Birmingham manufacturer Israel Sigmund Greenberg. 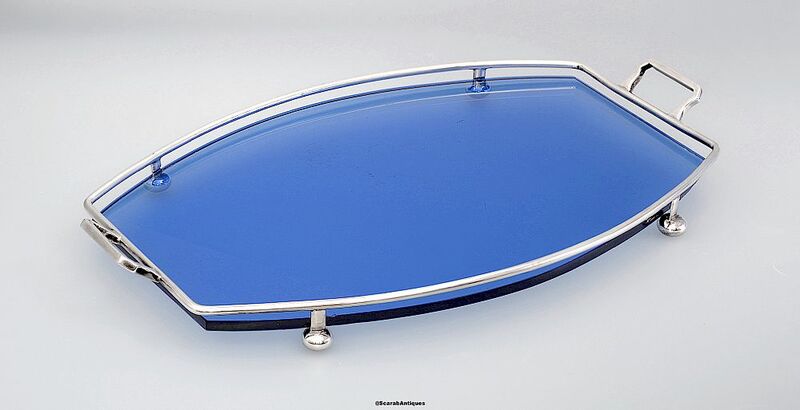 The rounded lozenge shape handled frame has bun feet on grooved legs so that the blue glass base drops below the top of the frame and sits on the grooves. The underside of the frame is marked "Pat App For" & "EP ISG NS" the latter mark being electro plated silver and Israel Sigmund Greenberg who was a Birmingham based silversmith founded in 1895.